Note: While we strictly tested these brooms on dog hair, they will work just as well with cat hair or any other pet that sheds. Have you ever tried to sweep up pet hair? No matter how many times you go over it, the fur appears to slip through your broom, as if by magic. Back and forth, back and forth. And, you still can’t get it all! That’s where a dog hair broom comes in. 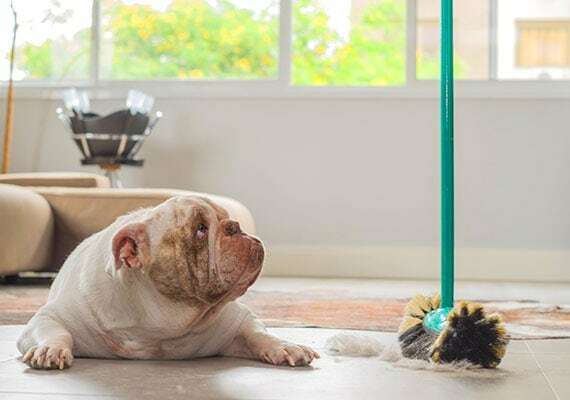 These brooms effortlessly lift and collect dog hair – they put your traditional broom to shame! Warning: These brooms will reveal how much dog hair is hiding inside your carpet – all the hair that vacuuming misses. 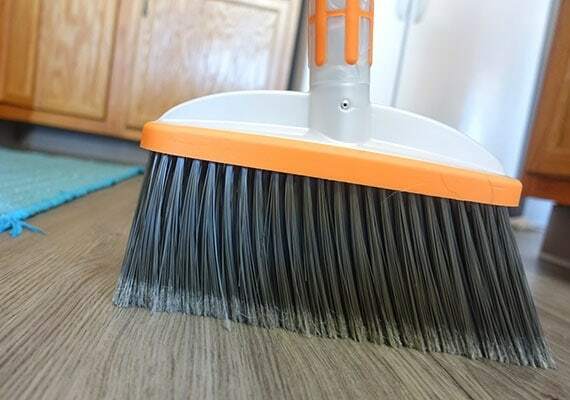 Which dog hair broom is best for your house? What is a dog hair broom and do you need one? As the name suggests, a dog hair broom is designed specifically to trap your pup’s fur. 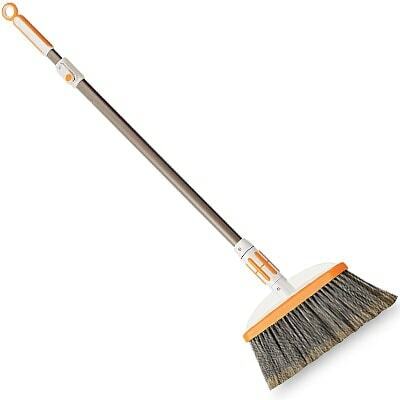 These brooms attract and trap dog hair, clumping it together for easy removal. Yep, that’s right. The hair clumps up, and you can even pick it up without a dustpan if you so choose. Your traditional broom just doesn’t compare. Those nylon bristles could sweep back and forth all they want, but they still fail to adequately remove dog fur – especially on carpet. So many stray hairs. Brooms designed specifically for removing dog hair differ dramatically in their appearance. As for whether or not you need one, it all depends on your dog. 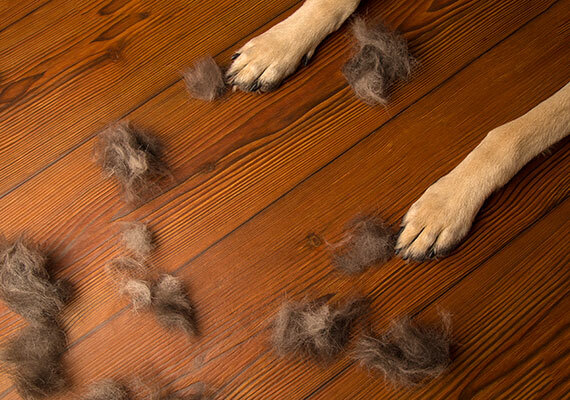 If you own a breed that sheds heavily, such as an Akita, Chow Chow or Golden Retriever, then you are all too familiar with the site of dog hair covering almost every area of your home. 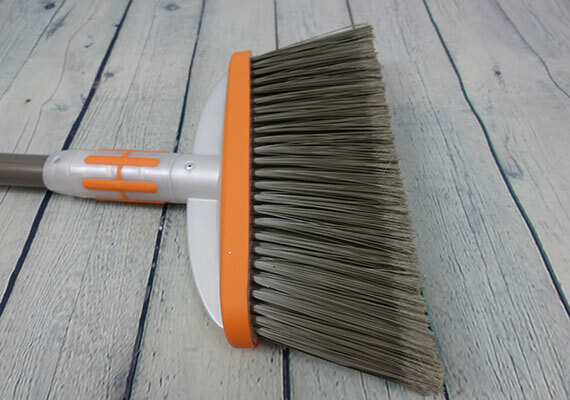 Anyone with a long-haired dog will greatly benefit from a dog hair broom. Even when these dogs aren’t molting, they still leave hair everywhere. Look familiar? Then, you need a dog hair broom. On your clothes, in your bed (even if your dog knows he’s not allowed there), it also works its way into your carpet. Dog hair gets everywhere. Even worse, it clings to you like a magnet. 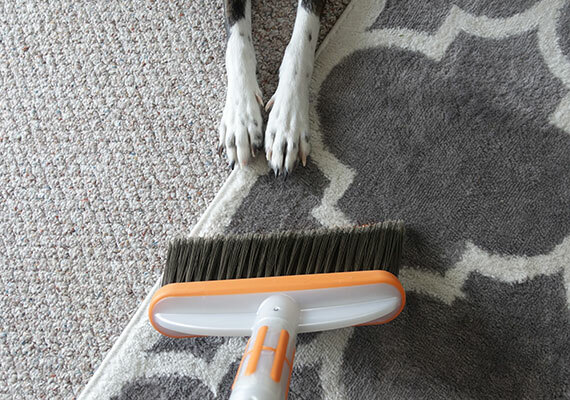 A dog hair broom is great for performing touch-ups between your regular clean. Say you have guests coming over who don’t want to leave covered in your pup’s fur. A quick sweep around with your broom is all that you need to do to give your guests a hair-free spot to sit. Before, I used to pull out my old clunker of a vacuum, attach the “dog hair” attachment, and listen to its obnoxiously loud hum as it worked overtime to clean a small area of hair. Combine this with my dog trying to play with the vacuum every time it comes out and this chore soon gets old – especially when vacuuming daily to keep up with your molting pup. Now, a quick sweep is all that is needed to rid my home of fur – I save the vacuum for my big weekly clean. 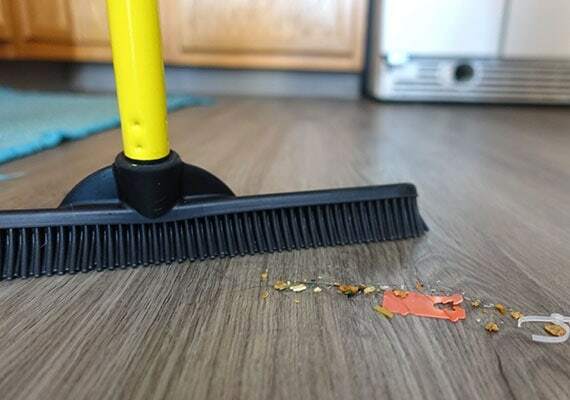 I generally use my dog hair broom to sweep up areas where I place things or where my daughter plays – my furniture and floors. This way when I set down my handbag, jacket and daughter, I’m not dropping them onto a pile of fur. I live in Upstate New York, and it has been cold. Too cold to brush my Border Collie outside. Her paws freeze. So, I’ve been brushing her inside. The amount of fur that comes off her is ridiculous – I could make a life-size version of her out of the fur that comes off. Anyway, this brushing routine has seen more hair than usual find its way onto my floors, rug and every other corner of my home. A dog hair broom has been a lifesaver! Picking up dog hair with less effort? What’s there not to love? Like my former neighbor. She slept with three fully grown Alaskan Malamutes. You had better bet that her king-sized bed was always covered in dog hair. Didn’t bother her in the slightest. But then, she hated chores too. If that sounds like you, then I’m not sure you will find much value in a dog hair broom. But remember, even if dog hair doesn’t bother you, that doesn’t mean it won’t bother your guests. Dog hair is a problem that almost every dog owner has to deal with. This is why we were so surprised that there are not a whole lot of products available to address this. Ordinarily, we spend countless hours researching before we narrow down which products to purchase. 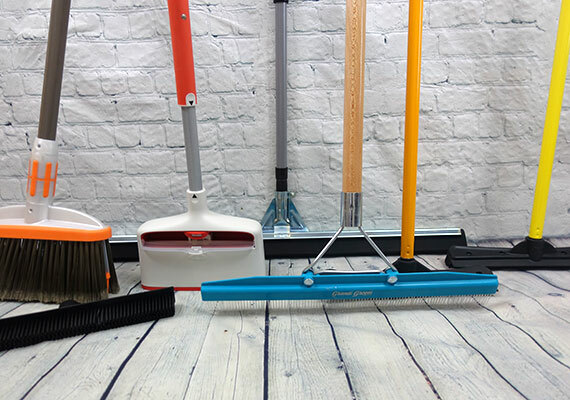 However, when it came to dog hair brooms, we decided to test all 7 different models. As usual, all products in this review were purchased from Amazon.com at full price. The entire testing process was actually pretty simple. I mean, they are brooms after all! To prepare for testing, I skipped vacuuming for 4 days. Oh, my husband didn’t love that. There was fur everywhere. Our daughter was covered in so much of it that she looked like a tumbleweed. 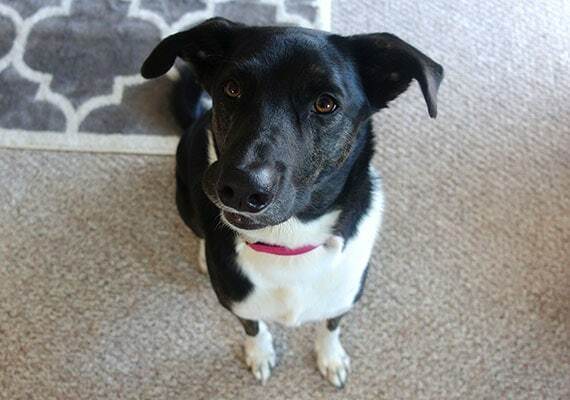 Harper is a German Shepherd-Border Collie mix. She sheds hair like it’s the one thing she was put on Earth to do. Like I said earlier, I used to vacuum daily just to deal with this fur dispenser. By the way, my home has a mix of laminate, wood flooring and carpet (low-pile and plush). After the house was overrun with hair, I used one broom to clean before waiting another 4 days to let the hair build up again. Each broom was graded on how well it swept hair from each surface – I even tested some brooms on my couch! How easy was it to store? How easy was it to dispose of the trapped hair? How easy was it to keep the head clean? 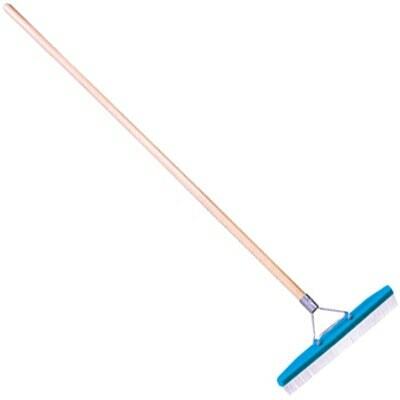 Would I trade my vacuum for this broom? All up, we tested and reviewed 7 different dog hair brooms. After countless hours sweeping up dog hair, I narrowed down the selection to 3 winners – each great in their own way. To start, I list the best dog hair broom for most houses before recommending winners for those looking for something more specialized. Want a broom that sweeps up everything? Nothing performed better on both hard and carpet floors. Twist the knob at the bottom of the handle, and these extend out, allowing you to sweep up dog hair. This unique combination of rubber meant that I could clean every area of my house with a single broom. 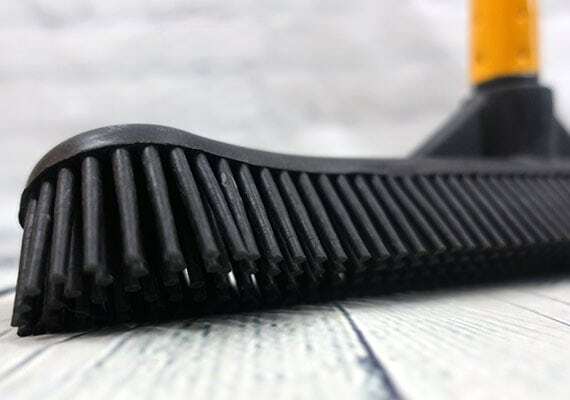 While the rubber bristles were great at trapping and collecting dog hair, they had issues in tight spaces and thin gapes, but that is where the flexible nylon bristles excelled. I found myself effortlessly swapping between the two on the fly. Rubber bristles for wide, open areas and switching back to the nylon ones when I came to corners and the edges of the molding. Once I swept dog hair away from these delicate areas, I switched back to the rubber to collect it. 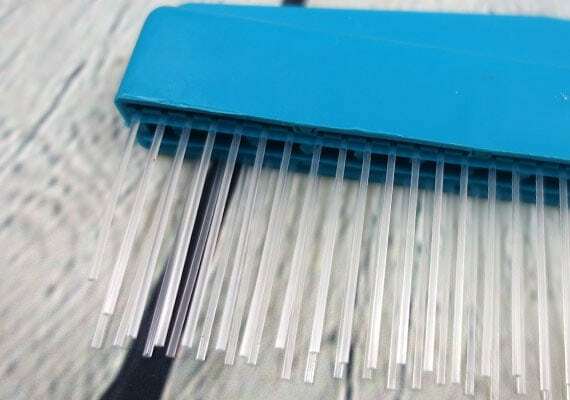 The nylon bristles swept up dust, lint and crumbs while the rubber bristles trapped dog hair into clumps. In many cases, I could bend over and pick them up without needing a dustpan. Yep, the handle is adjustable. Being on the shorter side, I enjoyed the fact that I could reduce the length to something a little more usable. I imagine reducing the length could be helpful when storing the broom too. Speaking of which, there is a loop at the tip of the handle if you prefer to hang your brooms instead of standing them upright. Oh, and it works great on low-pile (short) carpets and rugs. With the rubber bristles extended, I could scoop up any dog hair that was on the surface. My curious pup annoyingly followed along behind me rubbing herself on the carpet, leaving a trail of hair as she went. Fortunately, a quick sweep took care of that too. Cleaning the bristles was simple. A quick clean with a paper towel over the garbage can was all it took. A clean broom head in seconds! While the rubber bristles were great for hard floors and rugs, it took some time to clean larger sections of carpet. If you have large areas of carpet, you probably want to check out our next two picks – they will get the job done in half the time. 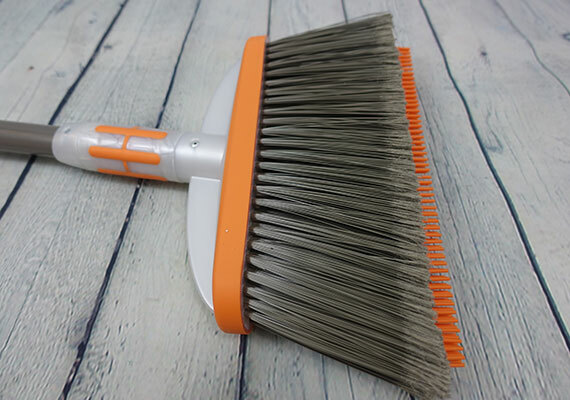 If you are looking for a broom that will do your regular sweeping and collect dog hair, then the Bissel pet hair broom is the best choice by far! A plain, rubber broom that excels at trapping dog hair on carpet and hard floors. Already have a traditional broom you love? Then, you probably just need a broom for dog hair and nothing else. The Sweepa is exactly what you need. Despite the completely rubber head, it doesn’t move or bend. It remains rigid as you push it across your floor or carpet. Interestingly, the broom bristles don’t collect debris and hair. Instead, they push it along into a neat pile. The only thing I had to remove at the end of my sweeping session was a bit of lint that stuck to the front row of bristles. If you have hair under the molding, in corners or trapped against table and chair legs, you’ll want to sweep this out into the open with a traditional, nylon-bristled broom first. But in the open areas, the Sweepa was a beast. Collecting crumbs and hair, nothing was safe. The bristles really shine on hardwood or tile floors. 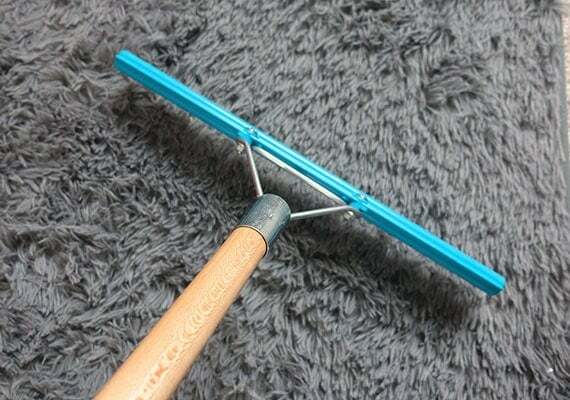 A squeegee runs along the rear length of the broom head. I found this useful to remove stubborn fur that was stuck to my floor. I actually used this squeegee side when my daughter knocked a glass to the floor. I dragged it across the floor to ensure I didn’t miss any broken pieces – something that is always a concern with bristle brooms. Running the broom over your carpet will pull crumbs, hair and all kinds of dusty things to the surface. If you’ve had your carpet or rug for a few years, you’ll be disgusted by what you find. For best results, use quick, short strokes with the squeegee side. This broom will give your carpet a new lease on life! Well, as long as your carpet is low-pile (short). When I tested this broom on my long, shaggy rug, no dog hair was removed – even though I could see it. The broom only brushed the top, and the bristles seemed unable to remove anything that was trapped deep inside the shag. If you have a high-pile (shaggy) carpet, check out my next recommendation. It works wonders! The best part about the head is that very little fur sticks to it. Besides a couple of long hairs that became tangled in the bristles (mostly mine), I didn’t have to spend any time removing dust bunnies and hair from the bristles. Being made from rubber, it rinses clean easily. 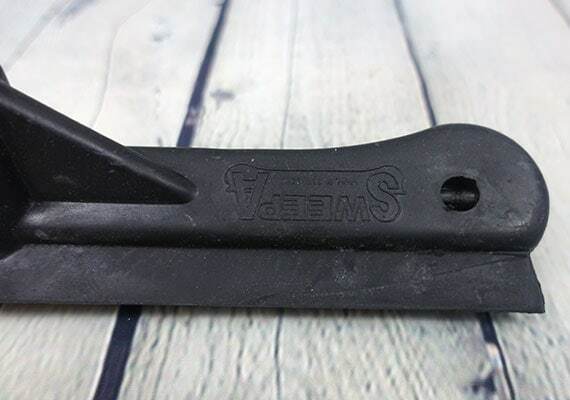 Interestingly, the Sweepa is nearly identical to another dog hair broom we reviewed, the much more popular FURemover. At first glance, they look nearly identical, but we had to award Sweepa the winner on account of it being made from a thicker rubber, which made it substantially more effective on carpet. My only complaint is that the handle and head are sold separately. I mean, who wants half a broom? It can take a bit off pushing to attach the handle, but once it’s on, it stays on! There are a variety of handles to choose from. From telescopic poles that halve in size to rigid 59-inch poles. I highly recommend choosing a rigid handle – the telescopic one had a habit of loosening and collapsing when in use. 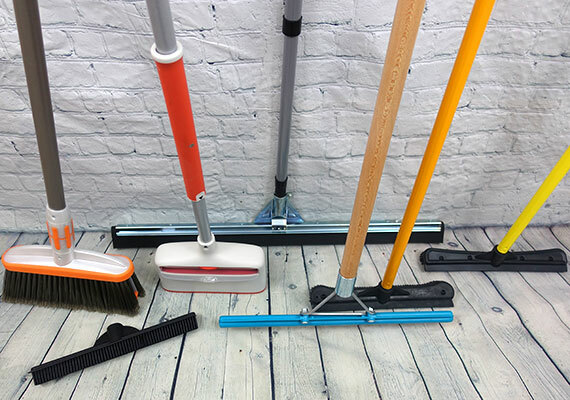 Once you choose a handle and assemble your broom, you can tackle dog hair no matter where it hides on your floor. A rake that is capable of lifting dog hair from the deepest depths of your high-pile carpet. I swear, high-pile carpets are like a black hole. Dog hair, crumbs, small toys and anything else that falls to the floor disappear into the fuzzy, shaggy sea. Brooms and even vacuums might be able to remove hair from the surface, but anything deeper needs a specialized tool. That’s where the Grandi Groom comes in. 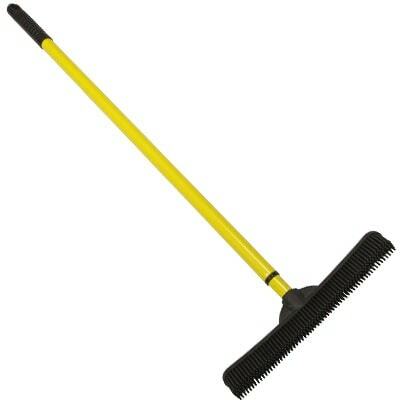 The Grandi Groom is similar to the rake you use to clean up your yard in the fall. 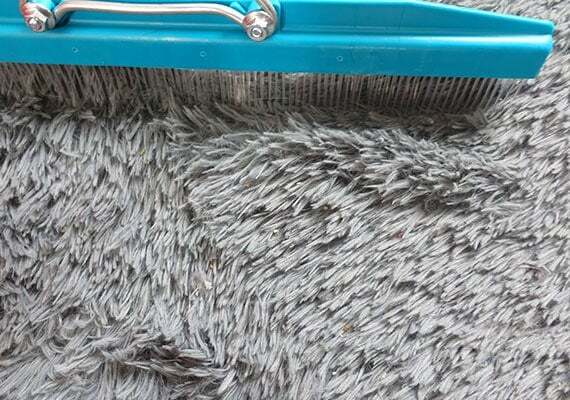 The only difference is the two rows of bendy, nylon teeth are designed for removing fur from tall carpets and rugs. While the instructions say to use a back and forth motion, I got the best results by plunging the teeth of the rake deep into my carpet and dragging it toward me. I was actually disgusted at just how much fur, lint and other gunk the Grandi Groom freed from my shaggy rug. This is a rug that gets vacuumed daily. I even found a long-lost Lego monkey that made my daughter cry for an entire day when she lost it. But where the rake really shines is dog hair. Individual hairs got trapped in the teeth of the rake and easily lifted out. The 18-inch-wide head allowed me to cover an impressive amount of area with each brushing movement. 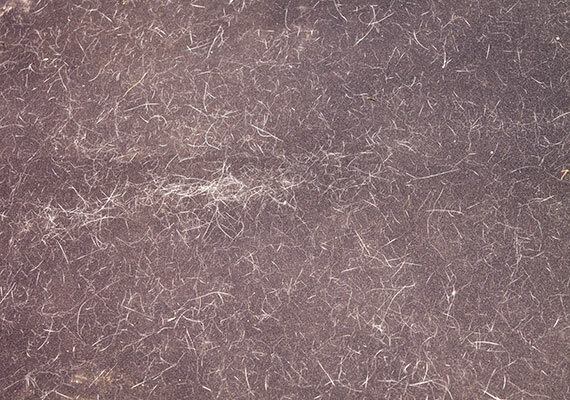 The rake brings dog hair to the surface of the carpet. Very little actually sticks to the rake. Because of this, you need to go over your floor with a vacuum after brushing. But it’s worth it. A quick vacuum and the entire carpet looked like it had been professionally cleaned. The rake also lifted compressed areas of the carpet, making it look soft and new! While this rake works on low-pile carpets, it’s only good for hair and lint. Small pieces of dust and crumbs just bounce around – it performed considerably better on high-pile carpet. Oh, and I don’t need to tell you that the Grandi Groom is unsuitable for hardwood, tile and vinyl floors. But if you have a high-pile carpet, there is no better tool for cleaning up dog hair. Highly recommended! The following brooms fell short in one way or another when compared to our top picks. That isn’t to say that these are bad products. They were still capable of cleaning up pet hair. But when compared to our recommendations above, we see little reason to choose them. The OXO Fur Lifter Self-Cleaning Carpet Rake is an unusual product. 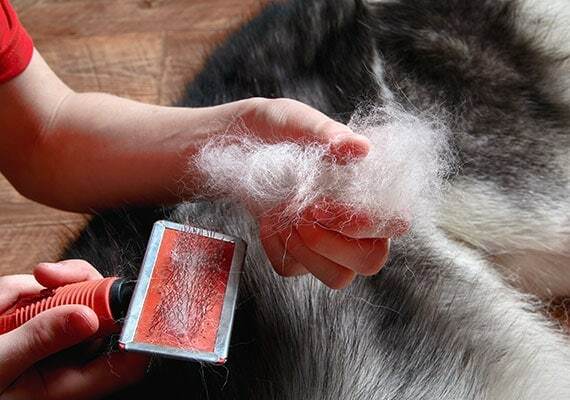 It picks up dog hair like the lint brush you use on your clothes. It then deposits the hair in a collection area. It’s only really suitable for small areas of floor, especially if your dog has a heavy fur coat, because the collection area fills quickly. The brush head was also the smallest of any dog hair broom we tested, meaning it took more work for the same area. A bonus is that you can use it on your couch, but it’s more awkward to control than a handheld lint brush. I was surprised that the Evri Holder FURemover Broom didn’t perform better. It’s the most popular dog hair broom on the market by a long shot. The expandable handle was difficult to lock into place. I found the handle loosened as I swept, causing it to collapse on itself. The problem was consistent across two brooms. I guess the main appeal is that it’s cheap. I highly recommend grabbing the Sweepa instead. It’s made from a thicker rubber and swept better. The same goes for the Evriholder FURemover Compact. If anything, the handle was more finicky. 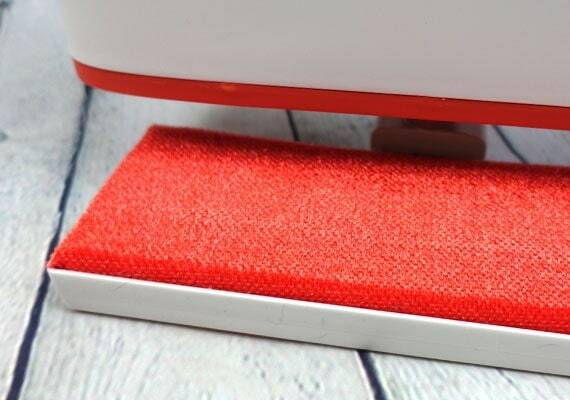 The Ettore Wipe and Dry Floor Squeegee was too big for indoor use. I found it handy for removing dog fur from outdoor tiles, grout, brick and other coarse, uneven surfaces. But I also found it just as easy to clean those areas with a hose – a product that I already have on hand. The 30-inch-wide head made it difficult to store. If your dog camps out in your garage and you want to quickly remove all traces of fur, then this might be worth checking out. It’s a great, durable product, but I find difficulty in coming up with a practical hair removing use for it. Phew, if you have made it this far, congratulations! You now know which broom is best for cleaning up your dog’s fur. Which broom do you use to clean up your pup’s hair? Let me know in the comments below!